Papillon Bleu UK: One World One Heart this is the day to reveal my giveaway! One World One Heart this is the day to reveal my giveaway! happy thoughts to be able to fly.I wished I could grab this balloon and go very far. So, once my spirits were lifted, ideas started popping and buzzing and dancing in my mind . And the fever of creativity started to shake my body , my hands started grabbing the scissors,glue, and brushes. This is how this little thing slowly appeared before my very eyes.Yes, it is little(14cm...) but big enough to make me smile . And guess what? You will also have a little surprise with it! Can't show you...it is a surprise... unless you insist I might show you but...another day!he!he!Today I will keep it as a mystery. Ready? Live a message with a link to your blog so I can contact you.OK? The winner will be revealed on the 15th February 2010. Les francophones qui passent par ici sont toujours plus que bienvenu(e)s! Si vous souhaitez gagner la petite mongolfière et la petite boîte surprise, laissez moi un petit mot ici avec un lien vers votre blog pour que je puisse vous contacter si vous avez été tité(e) au sort! + the surprise box for just ONE person.OK? Oh, I can't wait to go read your blog! I LOVE that you are an expert in daydreaming! Me too! Please put my name in your drawing...and then come visit me because I am participating in OWOH too! Very cool! I love surprises! Please add me to your list. My blog is http://www.maybeads.blogspot.com -- I'm participating, too! I love suprises Patricia, please add me to your list, don't forget to visit me too. WOW! Your video is so neat! And that giveaway is amazing! Super amazing at that! What makes my heart fly? Creating. It's what takes me anywhere I want to go! And I would love to be carried away by this balloon! love surprises so please count me in!! I love Balloons. Thanks for the chance to win. I love balloons. Thank you for the chance to win. Elle est magnifique, la vie!!! Passe donc sur mon blog, j'ai aussi un cadeau. je ne suis pas sûre que ça ait marché! You are the queen of the world! WOW. I had such a nice visit. Thank you! You are the queen of the world! Thank you for such a wonderful visit! I love surprises! Thanks for the chance! Hi Patricia! had to giggle what you call the love of your life, lol ...Moochoo! Well, your blog and giveaway is not to be missed because I LOVE surprises and boxes of course. I have a big collection of boxes. 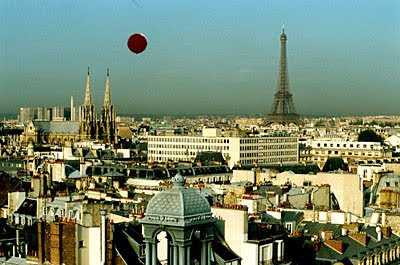 One of your pictures reminds me of a film I saw Called The Red ballon, Twas very many years ago :-) I am sure it was a french film. Love the ballon & surprises. Your video was cute. Off to go look around. This is interesting :) Please count me in. Wow, this hot air balloon is simply jaw dropping. I am totally impressed and in love with it. Cute video! Wonderful hot air balloon and surprises are always great! So cute, I love the video. p.s. I loved your video!!! OH my gosh , I would love to be entered in your giveaway. Your boxes look so incredbile and your blog is awesome. I love the music that is playing. I wanted to be a follower but it is down at the moment, will add you to my favs and click the follower button when they are done doig maintenance. I love surprises and thanks for the great giveaway. So incredible! I'm off to go explore more of your art and blog (thankfully I won't need a hot air balloon to do either)! Sweet! I started a Ning network that might interest you: www.fiberfocus.ning.com. I'm also a participant in OWOH, #501. I'm giving away a gift certificate to my Etsy store for anything from Afghanistan, land of the magic carpets! Come and visit my OWOH giveaway! 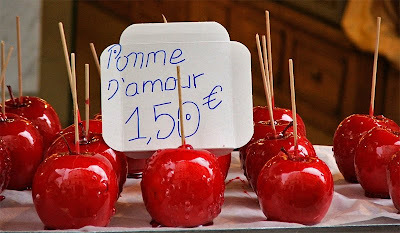 Au fait j'avais oublié de te dire que j'adore les pommes d'amour. J'espère que ça marche de nouveau pour les commentaires. Oh, Patricia, the balloon is super cute! Liberty loves hot air balloons, I'll show her your fabulous video in the morning. Ohh what a wonderful story, much better as mine. I loveeee surprise, hope I win. Balloons are love! And I can't imagine what awesome surprise you have in store! I love surprises, please count me in ! At long last I can leave a message! I have visited so many times but COMMENTS did NOT work! Well, here I am again to say: PLEEEEEEEEZ tell me what is inside the box!!! Pretty pleeeeeeeeeeeez. What a wonderful giveaway you're offering! I'd love to enter and you can enter on my blog as well. #227 on the list. I love your selections of art and your blog, they are both very beautiful! Please take a moment to "ride the carpet with me" ticket number 194- Dragonfly Design Studios. What a cute hot air balloon! And who doesn't love surprises? Please count me in. Thanks so much! First of all- awesome blog!can't wait to keep reading! 2nd- WOW that video was amazing and i would LOVE LOVE LOVE to fly that hot air ballon ;) so creative!!! Hallo Patricia,I adore your work, please enterme into your draw,Linda :) and do visit us at.. I love your work! :) So pretty! The hot air balloon is so beautiful and original! I would love to be the lucky person who gets to open the surprise box! Thanks for hopping aboard the magic carpet ride. I hope you have time to pop by my blog #258 on your journey. what a fab giveaway, please count me in. Why not pop over to my blog now and join in my giveaway. So cool! Please count also with me... I´m always here looking forward to your new fairy-tale-ish posts. Yes, it's cute as can be! I loved the video too! Crossing my fingers that I win! Oooh, I so love surprises! And balloons. We're coming up on Kite Season around here, and it's always so soul-freeing to watch balloons and kites and bits of colors whirl around the blue sky! And I am itching to know what the surprise is. I hope I win, so I can find out! Hi Patricia, Add me to the list, please. The hot air balloon is is cool. That's a wonderful post Patricia, I love your video. I think my other half of me sitting next to each other, holding hands and watching the world go by. That's what makes my mind fly. Thank you for the chance to win one of your great creations! It's nice to meet you and don’t forget to come visit me too. I'm giving away a Xyron 5" Creative Station! I’m #391 on OWOH. Hey fellow expert in daydreaming, I happen to adore prizes AND surprises too! Love to win this one! If you have a spare moment, please visit my blog and see if you can win an altered book with surprises inside! Agathe a dit : "elle vole vraiment la mongolfière ????? et moi j'adore la musique !!!!!! muxu, muxu. What a great giveaway..thank you so much..You are so very talented...please enter me..
Well, you've got me intrigued, please add my name to your draw. I'm off for a look around your blog. This a wonderful and exciting event, with so many participants to keep track of, I hope you get a chance to visit my blog too (if you haven't already). Que le sort soit avec moi!!!!!! I love surprises!!! It is so delightful to find new blogs on this Magic Carpet Ride. I hope you are having as much fun as I am in my travels. 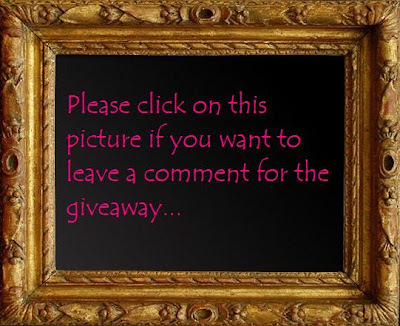 Please enter my name in your giveaway and stop by (#52) to enter my beaded bracelet giveaway. What a lovely giveaway and such a treat to visit your blog. Be sure to come visit (#663) and enter my drawing. Would love a chance to win a surprise! if I win I can be traced here http://stampingbyh.blogspot.com thank you. coucou, merci de ton passage chez moi, je signe pour le rêve en boîte !!!! la princessoptipoa c'est ma belle-soeur trisomique dont je maintiens le blog, comme c'est une princesse elle ne touche à rien hein !!! What a neat giveaway! Please add me to the growing list for a chance! Love love surprises! Count me in please! Wow, surprise me please, I would love to be in the draw. I am stopover #70 on the Magic Carpet Ride, please come on by for a visit and enter my draw too. Oh wow! That is beautiful. I love hot air balloons. I was looking for something like this for my little girl's red and white themed room. That's darling! Brings me back to my childhood when I could so easily believe the the stuff of imagination was always possible. Oh, I love the idea of a surprise box. Thank you for such a magical post and for the chance to win your wonderful giveaway. Wonderful!!! Yes please...add my name for your Giveaway.. Your blog is absoloutely stunning! Cute stuff on Etsy too! Glad to have found you!! Love your giveaway! Stop by my blog and enter,,there will be a little surprise inside mine too! All your posts are lovely Patricia and I would love to win the surprise. Wonderful post and blog...you have my attention! You can visit me #365 and #366 on the magic carpet ride! i was thinking last night about how Im a pantry snoop, i love going to peoples houses and looking at what they eat, and today watching my daughter play in her paddling pool, swimming with her ducks, It was so fun to watch I had to put my work down and just see it all, and take no photos either! some things are saved just for my memory. I love your whimsical work and am so glad we have met. ok im getting off now!!! such a lovely visit i've had on my magic carpet! so glad i landed here...what a delight you are! you are most welcome to stop by & chat if your carpet finds itself in my neck of the woods! OoOoOooo I do love a surprise! From the looks of your blog and your Etsy shop I'm sure it will be a wonderful one. you did a great job on the video, thanks for the opportunity to enter your draw! I love your video! :) and I love surprises. Please count me in your give away! Love your blog and love your little movie! ;) No worries that I have a film background I thought you did a great job! thanks for visiting my blog! I hope we can visit each other again soon! And yes, please enter me in your giveaway as well! Oh My Goodness! what a smile you gave me! That alone is a gift! Oh wow, a surprise! I love surprises. Please enter my name into your drawing. thank you for visiting my blog! your blog is wonderful!!!!!!! !what fantastic photos!!!!!!!! please put me in the list for the givaway! Omg I love it...I am so coming back to visit. Im reliving my childhood also...Please come by my blog at 485. Thank you for the smiles today. Love your baloon! I always wanted one of those for my room... but never got it. Surprises are all good! I would love to be a winner!!! Please enter me and be sure to come enter my OWOH giveaway too! I've been looking around your site. Your creations are so wonderful. Thanks so much for the chance to win. I'm following you now and adding a link to you on one of my blogs. Hope you have a great day! Oh Patricia what a darling little blog you have. Now, I must find out about those boxed dreams. Do you sell them? Can I buy some nice ones? My son and I have been making shoes for Peter Pan this week for his school project - lots of fairy dust borrowed from tinkerbell and a few feathers loaned by Tiger Lily. We had some fairy floss in the sky today but it was grey and tasted stale. I think we need to wait for the springtime fairies to reappear! Can you believe that I am #783?!? Whew! Great post. And I love surprises! Oh I just love these, please count me in! Thank you for playing in OWOH. Oh you are so much fun...surprises are even more fun...I can hardly wait to see inside! Enjoy your magic carpet ride!! Oh how I love surprises!! Please enter me in your fun giveaway! Love your music and am always up for a surprise. 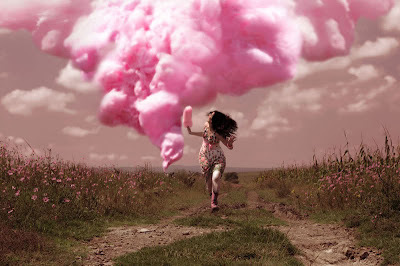 That looks like cotten candy the girl has in her hand. Makes me want a cone of it. Thanks. great giveaway, I love surprises! I love it....and the little show too! I would love to jump on a hot air balloon and cross over the mountain tops. What fun your blog is. So many interesting and inspiring things. I didn´t make it in time to catch the magic carpet, but I do have a give-away on my blog too, if you´d like to visit. please enter me in the drawing for the surprise box, who doesn't love a surprise?? how lovely!! I adore hot air balloons - I have never been up in one, but I always stop and stare when there is one up high in the air. Elle est très belle la vie! Je n'ai pas eu le temps de regarder ta vidéo parce que je file au boulot dans une minute mais je reviendrai. Je sais déjà, par contre, que je veux une chance de gagner! La boîte à surprise est jolie et j'adore les surprises! This is a beautiful and enrous offering Patricia. Fotuante will be the person who wins it. Good luck to them and Thank you to you and your beautiful mind. Surprises are nice! Please add my name to your drawing. And be sure to stop by #389 for my giveaway. I just want to tell you, that I have passed a blog award on you. ooOOOoo, This looks fun! Count me in! Greetings from Maine. Who doesn't love a surprise? Please count me in. Thanks. Love your blog! Please enter me in your giveaway! OHHHH A SURPRISE...How FUN!! Please enter my name in your drawing :) What a FUN event...enjoy the ride!! PLEASE PLEASE PLEASE add me!!!! I ride in a hot air balloon in my garden, in my mind...it looks like a gazebo to most people, but I go aboard and fly! I look out upon the flowers, see the birds fly beside me, take my dog along and he relaxes in the sunshine, that comes in and plays with us! We love the summer breezes, someday I will add lights and we'll fly away in the night! I would put the magic balloon of yours inside, it could hover! Hmmm I wonder what it is??? Thank you so much for the balloon ride; creativity makes my mind soar! I LOVED your video. Very nice give away. Please enter me. Be sure to stop by #657 and say hello. Oh Patricia can I come and live in your world - if not I'll settle for your wonderful balloon. That was the most cleaver video I have seen in awhile. You went through so much work! THank you so much for the opportunity to win such a lovely object d arte . What makes me fly is any museum of art. I come out of an art museum, like the Art Institute in Chicago, so recharged and ready to create that it almost feels like one is indeed flying! Thanks for a lovely stop on the magic carpet ride. Love your prizes!! Please enter me in your drawing. Love the music and love suprises, now more than ever! I do regret I'm not part of OWOH but surely next year... Count me in! I could totally use a box of dreams! And I love the balloon! !